Last month, Alaskans for Litter Prevention and Recycling (ALPAR) recognized outstanding achievements in recycling and litter prevention for 2013. Lynden, Inc., Alaska Marine Lines, Alaska West Express and Lynden Transport were recognized together as the Outstanding Contributor of the Year for support of ALPAR through the donation of shipping and transport services for the Railbelt's community recycling centers. "Each year we recognize an outstanding business or organization that contributes significant resources to further ALPAR's mission," says Mary Fisher, ALPAR Executive Director. "Lynden and its companies, Alaska Marine Lines, Alaska West Express and Lynden Transport, have been important contributors to ALPAR for many years by helping distribute our litter bags to communities across Alaska. In 2004 Alaska Marine Lines and Alaska West Express made a commitment to move recyclables to outside markets and in 2009, Lynden Transport stepped up partnering with the Alaska Railroad to move recyclables collected by the Fairbanks Rescue Mission's Recycling Center to Anchorage and on to markets in Seattle." Alaska West Express handles the containers from Anchorage to Whittier, Alaska Marine Lines transports them by barge to Seattle, and Lynden Transport handles them in Seattle as well as donating the shipment of some line haul vans from Fairbanks to Anchorage. "Lynden companies in Alaska have partnered with ALPAR for the last 10 years to donate the transportation of recyclables like aluminum cans, plastic bottles and paper, from Central Alaska to Seattle for recycling. We are proud to participate in this partnership to make free and convenient recycling possible for Alaska residents along the Railbelt," says Anna Deal, Lynden's Green Initiative Coordinator. "It takes many people in the Lynden Family of Companies to do this work and direct their resources to help us make recycling and litter prevention work in Alaska," Mary adds. "Thanks to them, ALPAR can provide services to our communities that help the environment and keep our communities litter-free without significant government support." ALPAR is a non-profit organization dedicated to increasing economically viable recycling and eliminating litter in Alaska. Last year, Lynden’s Green Team once again asked employees for their ideas for Lynden to be "leaner and greener." The Green Team received more than 100 responses and many ideas have already been put into action. New paperless processes are available due to employee suggestions. For example, Lynden's IT group has improved systems to upload electronic images eliminating the need to print and then scan. Lynden Transport and LTI, Inc. are testing electronic-logs to replace paper time cards, and Lynden Transport is testing the use of handheld devices to collect signatures electronically rather than using paper driver records. Lynden International has reduced its greenbar paper waste by 40 percent by changing to electronic reports and eliminating unnecessary prints with their General Office is saving roughly 180,000 sheets of paper and $6,000 per year. There were a number of recommendations to provide extended training for use of the paperless EZ commerce system. As a result, a Learning Management System (LMS) training piece is currently under development to teach sales, customer service and accounting employees how to help our customers use the EZ commerce. Energy efficiency was a top priority for employees who responded to the survey. Between 2008 and 2010, nine Lynden locations invested in energy efficiency upgrades such as lighting, motion sensors, dock seals and fans. Together, these investments are saving nearly 1,000 megawatts of electricity, 25,000 therms of natural gas, 415 metric tons of CO2, and over $100,000 per year in energy costs. Lynden Transport's Fife Service Center recently replaced high pressure sodium lights with energy efficient LED lights, and upgrades are underway at Anchorage's South Air Park facility. Also in 2011, Alaska Hovercraft in Bethel, Alaska Marine Trucking in Juneau, and Lynden Transport in Fairbanks conducted energy audits to identify top priorities for energy efficiency. Lynden employees asked for recycling at locations where it was not yet available. Recycling programs are now in place at all 60 Lynden locations. Lynden recycles items that are accepted locally as well as toxic items like batteries, fluorescent lights and ink cartridges. In remote locations in Alaska, the Lynden system is used to backhaul items to locations where they can be recycled. Visit Lynden's Environmental Stewardship webpage to learn more about Lynden's green efforts! 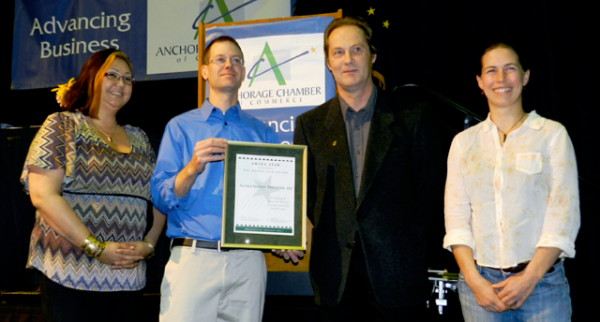 Alaska Marine Trucking is Juneau's first Green Star Award business. Employees worked hard to complete all 10 standards to achieve the Green Star Award, including adding the Green Star policy to the environmental policy statement in the employee handbook. Other efforts include replacing paper coffee cups with ceramic mugs, offering bio-friendly water bottles to reduce paper cup use, encouraging double-sided copying and improving fuel efficiency for vehicles through maximizing payloads and eliminating unnecessary weight. PeopleNet on-board computers monitor truck speed, shifting and idle time. Employees also participated in energy audits, implemented a company-recycling program, and removed lighting from vending machines to cut down on unnecessary energy use. “Alaska Marine Trucking has blazed a trail in Juneau for efficient and energy-wise business practices," says Christina Grande, Community Outreach & Communications Coordinator for Green Star in Anchorage. From left: Green Star's Kim Kovol and Randy Virgin, Alaska Marine Trucking's Bill Merk and Lynden Inc.'s Anna Deal with the Green Star certificate at the Anchorage Chamber of Commerce luncheon. When it comes to reducing waste and cost, Lynden employees know where to look and what to do. Lynden's Green Initiative Team went straight to the front lines to ask what the company could do to improve its environmental performance. The employee survey results showed that employees welcome the opportunity to work "green" and some already have ideas ready to be put into practice at Lynden companies. Lower the speed on trucks and marine vessels to conserve fuel and power down computers that are idle. Lynden's employee newsletter also contains a monthly "green tip" encouraging employees to adopt environmentally friendly lifestyle and work habits. These efforts are a great way to celebrate the 40th anniversary of Earth Day this year. From the Lynden Archives: This article was originally written in February 2010.